Appleton OZ Gedney Square conduit outlet box of trade size 3/4-Inch, features copper-free aluminum construction and aluminum enamel finish. This box provides access to conductors for pulling, splicing and maintenance. Conduit outlet box with NPT connection, has 13 tapered threaded hubs. 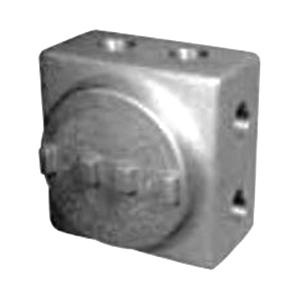 Conduit outlet box has smooth hub bushings that protect insulation while pulling conductors. It measures 3-1/2-Inch x 4-5/8-Inch. Conduit outlet box is UL listed, CSA certified and meets NEMA standards.